I have come to Bolivia to gather data in two Quechua-speaking communities: one in the town of Tarabuco northwest of Sucre, and the other in Toro Toro north of the city of Potosí. Specifically, I am interested in doing a post-acoustic analysis of the uvular sound effects in high vowels /i u/ comparing the Quechua dialects of these two communities. I started in Tarabuco which is the center of the Yampara culture. To get there, I flew to the city of Sucre, the constitutional capital of Bolivia. Tarabuco is located 64 kilometers from Sucre and it is known for its colorful knitted fabrics. When I got to the community, I looked for Quechua-speaking subjects originally from Tarabuco to record them. I met a young girl, Emiliana, with whom I spoke in Quechua the entire time. 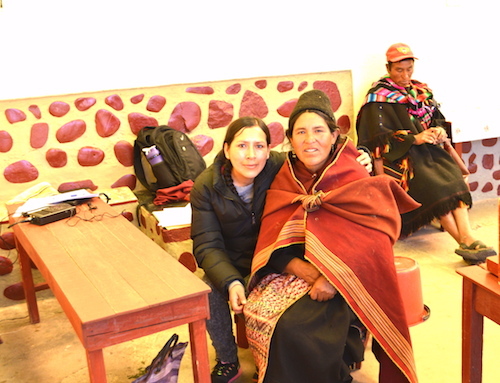 She was very friendly and helped me find other Quechua-speaking subjects. The recordings I made used the following methodology: subjects had to do an organized recording according to my schedule. First, I explained the activity in Quechua and they had to agree to be recorded. Then, I pronounced the selected Quechua infinite verbs using my flashcards. Each subject conjugated the verbs orally in simple present. All the while, I will be present recording everything that the subjects said. For example, I would say ‘Phukuy’ (to blow), and the subjects would respond ‘Ñuqa phukuni’ (I blow). After that, I asked for their personal information (age, education, their use of Quechua, etc. ), and then, I asked if they were familiar with a list of vocabulary words that people do not normally use but that are mentioned in many dictionaries. I also asked them to identify sounds in lists with real words. For instance, if they would say ‘qilla warmi’ (a lazy woman) or ‘qhilla warmi’ (a lazy woman) I wanted to know if they use a simple sound /q/ or an aspirated sound /qh/, thus subjects had to identify which sound they use. I also interviewed three subjects about the process of making ‘chicha’, a traditional Bolivian drink. On Sundays there is a big free market in Tarabuco. 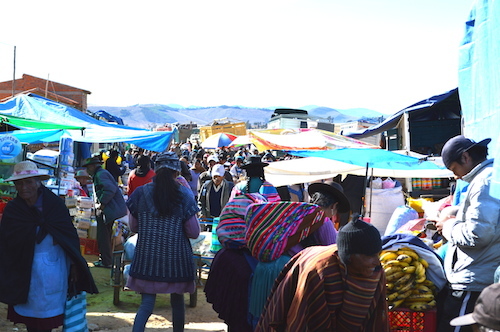 Many people from the surrounding small communities come to find different products as well as livestock. I went to the market after set up at 6:00 a.m., and saw people buying, selling and eating. I spent some hours listening to their conversations in Quechua and spoke with many of them. After every conversation I had or heard, I took notes of the variations they use in their dialect. I did not want to write notes on a notebook in front of them, so instead I used my cellphone and that way it seemed like I was sending an sms. 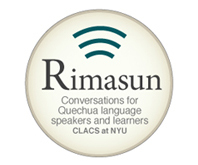 Standing next to people who were talking in Quechua, the first variant that I listened to was the present progressive in Quechua. People in Tarabuco pronounce the velar fricative [x], and I say the post-alveolar fricative [ʃ]. 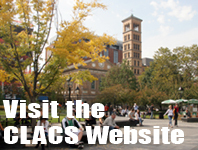 This entry was posted in Recent Research and tagged Bolivia, Bolivian Quechua, Quechua, Tarabuco. Bookmark the permalink. It would be possible to have some examples about the differences between those variations of Quechua? I’d really appreciate it! Here are some examples of the dialectal variations. Variations between velar fricative and post-alveolar fricative. Tarabuco [x] Toro Toro / Cochabamba [ʃ] here are some examples [rikuxani] [rikuʃɑni], [rixan] [riʃɑn]. Finally the Cochabamba plain uvular sound “q” in most of the cases is voiced fricative [ʁ] in Cochabamba/ToroToro whereas in Tarabuco they use the voiceless plosive [q]. I am still working on the acoustic analysis now. I will provide you more details when I finish this work. Thank you.